When Britain and China negotiated the future of Hong Kong in the early 1980s, their primary concern was about maintaining the status quo. The rise of China in the last thirty years, however, has reshaped the Beijing-Hong Kong dynamic as new tensions and divisions have emerged. Thus, post-1997 Hong Kong is a case about a global city’s democratic transition within an authoritarian state. The future of Hong Kong. 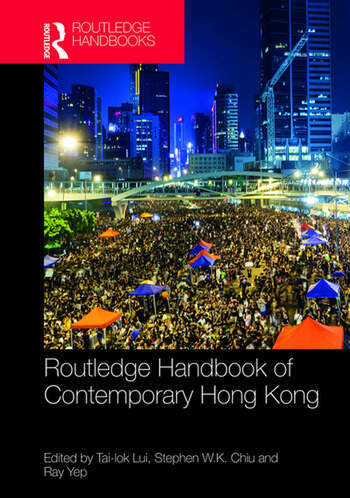 This book provides a thorough introduction to Hong Kong today. As such, it will be invaluable to students and scholars of Hong Kong’s politics, culture and society. It will also be of interest to those studying Chinese political development and the impact of China’s rise more generally. Tai-lok Lui is Chair Professor of Hong Kong Studies and Vice President of Research and Development at The Education University of Hong Kong. He is the co-author of Hong Kong: Becoming a Chinese Global City (2009). Stephen W.K. Chiu is Chair Professor of Sociology and the Co-Director of The Academy of Hong Kong Studies at The Education University of Hong Kong. His recent publications include Repositioning the Hong Kong Government: Social Foundations and Political Challenges (2012). Ray Yep is Professor of Politics and Associate Head of Department of Public Policy, City University of Hong Kong. His recent publications include Negotiating Autonomy in Greater China (2013).